In much of the inland western United States and Canada, there are two common breeding white-headed gull species, the California Gull and the Ring-billed Gull. If you live in this region, the first step in learning your gulls will be to learn to tell adults of these two common species apart. 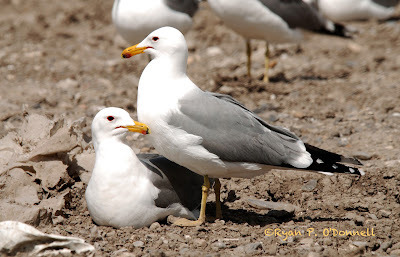 When they are perched on the ground, it is not difficult: California Gulls have dark eyes, red and black on the bill, are slightly larger, and have a slightly darker mantle (back). 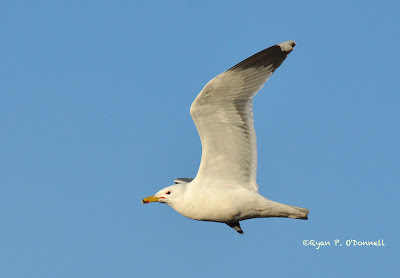 In contrast, adult Ring-billed Gulls have light eyes, a black ring around the bill without red, are slightly smaller, and have a paler mantle. A pair of adult California Gulls in breeding plumage, showing their dark eyes, red and black on the bill, and relatively dark mantle. Photographed 13 Apr 2009 at Logan, Utah. 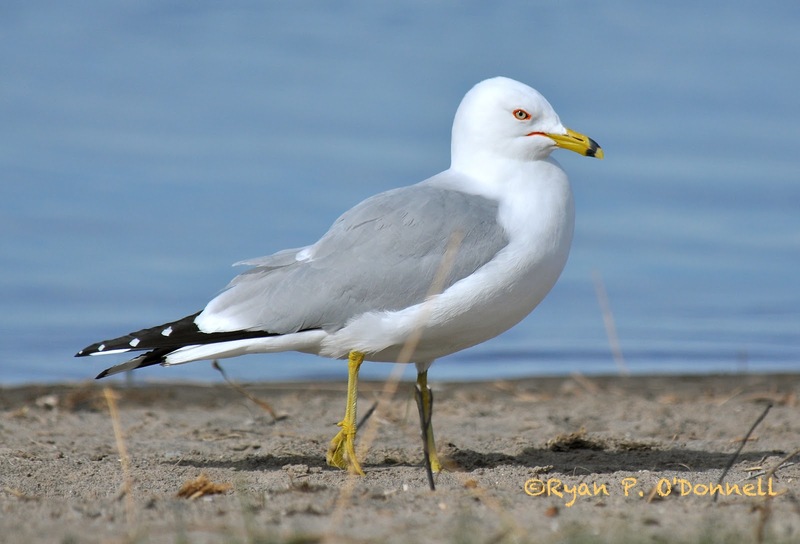 An adult Ring-billed Gull in breeding plumage, showing its pale eye, black ring around the bill without red, and relatively pale mantle. Photographed 2 May 2011 at Blackfoot, Idaho. 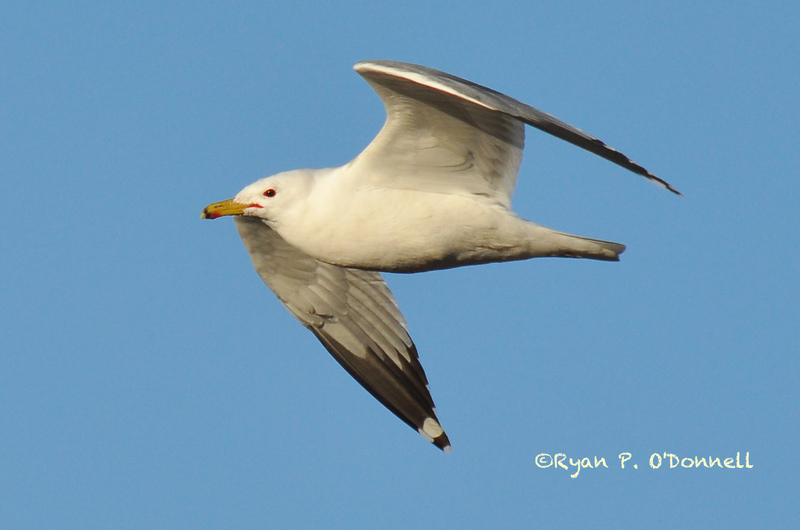 Even with these relatively distinctive gulls, identifying them in flight can often be difficult. Sometimes, it is possible to make out the same features in flight, especially with close looks in good light. Look especially for the eye color and the bill markings, because size and mantle color are particularly difficult to judge on a bird in flight. Adult California Gull in breeding plumage. Even in flight, the pattern of black and red on the bill and the dark eye can be obvious. Photographed 17 Mar 2013 in Mendon, Utah. Adult Ring-billed Gull in breeding plumage. Even in flight, the black ring on the bill (without red) and the pale eye can be obvious. Photographed 17 Mar 2013 in Mendon, Utah. The real challenge, however, is in identifying these species when they are high overhead or lit in such a way that the eye color and bill pattern are impossible to distinguish. In this case, it is helpful to pay close attention to the pattern and colors under the wing. Both species have mostly whitish wings with extensive black near the tips and white spots at the very ends of the outer flight feathers. But, California Gulls have duskier inner primaries contrasting more with the rest of the wing, and Ring-billed Gulls have paler inner primaries that are about the same color as the rest of the wing. California Gulls also tend to have more black in the wingtip than Ring-billed Gulls, but there is some overlap in this trait. Note the darker gray band that stretches from the black wingtips into the outer secondaries on this adult California Gull. With practice and good light, this contrast could be visible from great distance on overhead birds. California Gulls also tend to have more black in the wingtips, but there is some overlap in this trait. Photographed 17 Mar 2013 in Mendon, Utah. 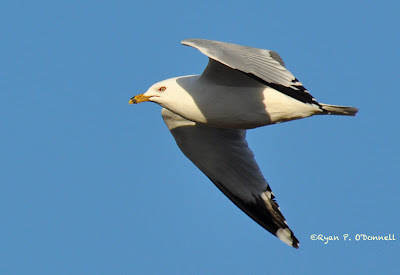 In contrast to the California Gull above, this Ring-billed Gull has much paler inner primaries and outer secondaries, which contrast less than on the California Gull. Some slight contrast is still evident, so it might take some practice in the field to get a feel for this field mark. 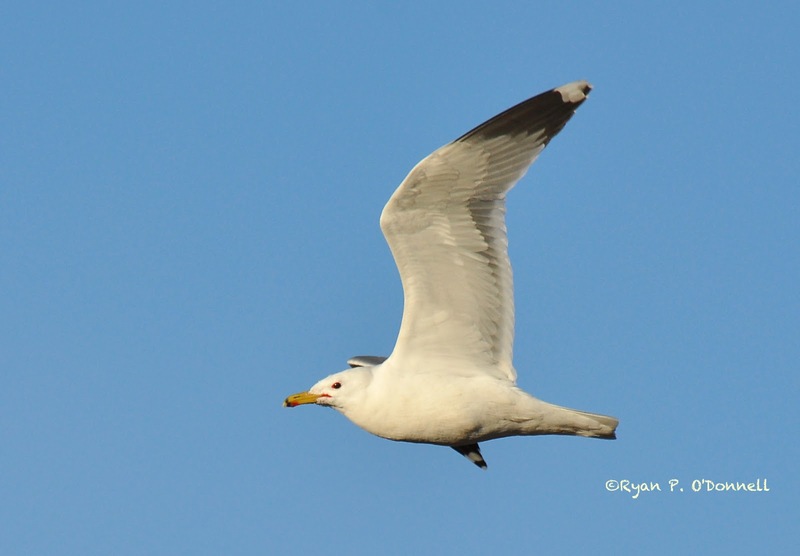 Ring-billed Gulls also tend to have less black in the primaries, but there is some overlap in this trait so it should be used only as a supporting character. Photographed 17 Mar 2013 in Mendon, Utah. California Gull in flight. Note again the relatively grayish inner primaries and outer secondaries, contrasting with the paler underwing coverts. Photographed 9 Feb 2008 in Logan, Utah. 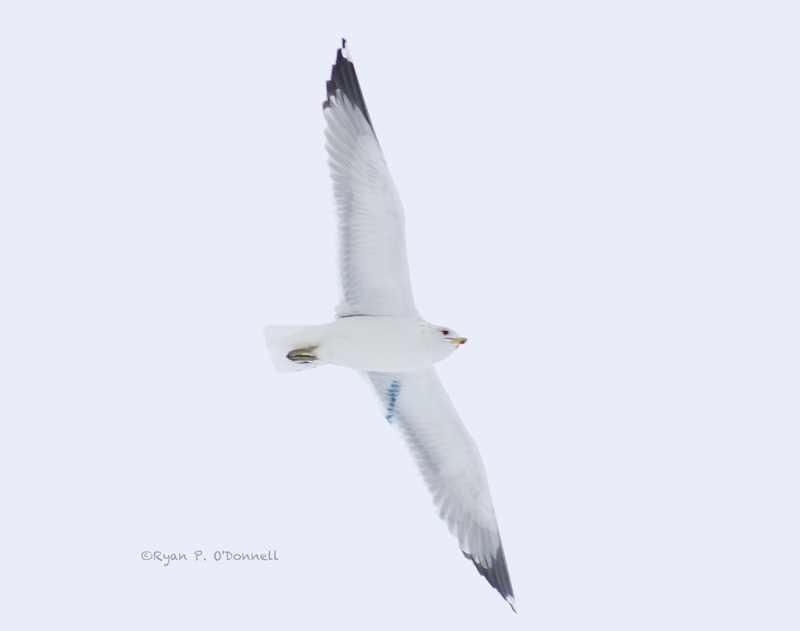 Ring-billed Gull in flight. The relatively pale inner primaries and outer secondaries almost lack contrast with the underwing coverts. Note that the extent of black visible in the primaries varies to some degree with the position of the wing and the individual, so this bird appears to have about the same amount of black as the California Gull above. Photographed 9 Feb 2008 in Logan, Utah. The differences in underwing pattern between these two species are subtle, and take field experience to get a good understanding of them. Of course, not every gull will be identifiable in every situation. 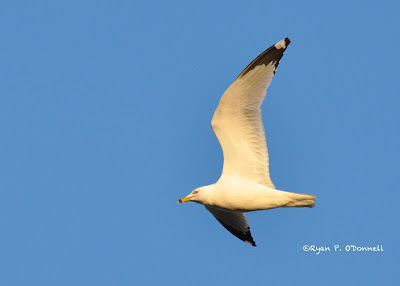 But with practice, you can learn to identify a higher percentage of gulls, even when they are seen only in flight high above you. Great tips for identifying these two gulls!